For those who intend to take the DIY approach – we recognise that building a garden deck can be a complicated process, especially for beginners or those who haven’t built a structure before. And while it might look intimidating, a decking is well within the means of anyone willing to learn their way. Our experts will testify that nothing beats the satisfaction in completing your self-built structure & sharing it with family & friends for the first time. In this guide you’ll learn that your new deck can be built in just 9 straight-forward steps. If you are finding a fitter for your deck, you can skip this section & move on to our decking aftercare guide. There you’ll find information & tips on what to do once your fitter has completed your build. It’s recommended that you read these before you start construction. Once you’re confident on each of these fronts, you’re ready to get started. We have broken this guide into various stages that you’ can follow to help build a structurally-sound, beautiful deck. If you’re taking on your own decking project then you’ll need to know your stuff! Once fully constructed, the horizontal joists & beams which support the decking are usually referred to as the decking ‘sub-frame’. All decking requires the same materials underneath the frame – ledger, joists, beams & support posts in solid footing. If you’re building an on-grade deck (a decking structure built just above the ground) then you might not need railings, features, posts or steps. An additional extra but can help to make your decking safer & visually appealing. Safety is absolutely paramount with decking projects, as they are often quite complex & labour-intensive. Always wear goggles when pressure washing or scrubbing with chemicals. We want you to be able to enjoy looking at your decking once it’s finished! When you’ve finished with timber cut-offs, don’t burn them. Timber is often treated with chemicals which can be harmful when inhaled. Use anti-slip decking paint, varnish or oil to help prevent slips & accidents. There are also some decking materials which are grooved in such a way as to prevent slipping. Note that decking can still be dangerous after it has rained – especially in winter months when this can turn icy. Take care where you tread. Where you are treating timber – make sure to always do so in a well ventilated area. Handling treated timber should always be done with googles & gloves; ensuring that you wash your hands thoroughly after handling. Keep children away from the decking area – ‘little helpers’ can be useful for some jobs, but this isn’t one of them! Grinding or cutting materials can often cause a great deal of dust & loose particles. Where this is the case, always make sure to wear gloves, googles, a particle dust mask & ear defenders. When building decking for pubs, bars, restaurants or other commercial spaces, it is advisable to always use fire-retarding treatment on the sub-frame – helping to prevent any accidents arising from lit cigarettes. If you’re happy you’ve followed all of these steps, we teach you how to lay garden decking in our 9 simple steps below. By now you should have completed all of your planning, during which stage you hopefully chose an ideal garden location for your deck. It’s important to properly prepare this ground beforehand so as to prevent any issues in the future. If you don’t intend on utilising an under-deck drainage system (which can often be very costly) it’s recommend that you build your deck on an oversite which is free draining. A gradient of 1 in 40 will usually suffice for a garden decking structure and this is recommended as the industry standard. Top Tip: Using grooved boards which run down the slope of your build will help any rainwater to naturally drain from your decking surface. If these run across your slope, they may collect rainwater & increase the moisture content of your boards. Fix pegs in the ground, marking out the corners of your deck. Use a builder’s line or string to attach the pegs and mark out the square dimensions of your structure. Within these dimensions, clear away all rocks, weeds & vegetation. Some might choose to remove the turf with a spade, though this is not always necessary. This exercise can help to rebalance your surface if you do not have a natural slope on which to build your deck. Use weed killer spray on the oversite to prevent any growth in the future. Measure out & cut a weed barrier sheet into sections so that it covers the entirety of your oversite. If you are setting footing posts for your deck, you’ll need to leave space for these. You can then move onto building the deck frame. First, you should spread pea shingle over the weed barrier sheet – spreading to an even depth of around an inch. This will help to absorb moisture during heavy rainfall and keep your deck frame away from the surface of the ground. Once the oversite is fully prepared we can then begin to make a start on the framing; starting with the outer frame. Joists should be fixed together along the perimeter of your oversite, which should be marked out with builder’s line. The joists should be bolted or drilled together using galvanised screws. It’s recommended you use one screw on the top edge of the joist and two on the sides, to keep your outer frame fully secure. Remember to use wood preservative on all sawn wood & wherever screws have been drilled into the wood. At this stage we can move on to fixing joists to your outer frame. Many people choose to lay their decking frame on concrete slabs. These help if you plan on laying your deck directly on the ground. Firstly, they provide a level, stable base for your frame to rest on – one which is not uneven or changeable. Secondly, they keep the frame away from the ground, which prevents the absorption of groundwater (which can often lead to rot & the degradation of your frame). Using your builder’s line as a guide, position concrete slabs strategically on your oversite; placing them over the top of your weed barrier sheet. You should ensure that a concrete slab is placed under all corners of your structure, as well as placing various slabs under the outer frame and all supporting joists. These should be spaced at least one per metre. This is very important as you need to provide enough load-bearing support for your framing. We can then make a start on the outer frame of your deck. Joists should be fixed together along the perimeter of your oversite, which should be marked out with builder’s line. Position and adjust the frame on top of the concrete slabs. You should use a spirit level to make sure that the outer frame is flat, but is sloping away from your house or adjoining building by a gradient of at least 1 in 40. It is recommended that your frame is fixed to an adjoining building or footing posts in the ground – otherwise it won’t be fixed in place & may not be secure. This is probably the most popular method by which to build a deck & for good reason. It gives the structure a solid footing which is incredibly strong & durable. This helps give the deck a longer lifespan as the structure is securely fixed; it also raises the frame above ground, preventing the absorption of rainwater. First, you should construct your outer frame. Joists should be fixed together along the perimeter of your oversite, which should be marked out with builder’s line. Once you have the positioning of your frame correct, you can mark out where your posts need to sit. There should be between 1m – 1.5m spacing between each post, ensuring these sit at regular intervals so as to provide enough structural support. Fix posts to your frame, screwing them to the inside of the timber. Use at least three screws per post. Remove the frame and dig out the holes you previously marked with a trowel. These should measure roughly 30cm in both depth and width. Decking which is raised off the ground will require deeper footings – the higher the deck is raised off the ground, the deeper the holes should be. Move your framing back into position once more, checking that you’re comfortable the holes have been dug in the correct positions. Check the positioning of your frame. You should use a spirit level to make sure that the outer frame is flat, but is sloping away from your house or adjoining building by a gradient of at least 1 in 40. Pour concrete into the bottom of each footing, ensuring sufficient depth to fix the frame in place. The concrete should be left to set for at least 7 days before any further work is carried out on the build. If this wasn’t already done during the construction of your outer frame, beams should be fixed onto every post along the longest length of the deck. A pair of beams should be bolted or screwed to either side of the posts for maximum deck strength. Beams should be spaced at maximum centres of 1.5m. At this stage, your build can move on to fixing the joists. This step is only necessary if you are fitting your deck to a building. Otherwise you can move onto fitting your joists. Many decking structures are fixed to buildings and act as an extension of the home out into the garden. Should you need to attach your deck to the wall of a house, it is very important to understand exactly where the decking frame will meet the wall. Decking can be attached to a fixed wall using ledger board. This should measure the length of the structure that will face the adjoining wall. Before starting this process, check that your ledger board is perfectly straight and has not warped. First, hold your ledger board up against the adjoining wall, ensuring that there are no obstacles such as wires which will get in your way. Holes should be drilled in the centre of the board – one hole for every 16 inches. Once you have begun building your decking frame, you should understand the height of your structure and where it needs to fix to your outside wall. After determining the right level, you can then offer the ledger boards up against the wall and use a pencil to mark through the holes. This should mark the spots where you should drill holes of at least 7cm in depth, to allow your screws to anchor the frame sufficiently to the wall. Anchor bolts should then be hammered into the holes, before lag screws are used to fix the ledger board firmly to the wall. Be careful to use galvanised screws to prevent rust. They should be screwed into the anchor bolts, with washers used between the ledger board and the screw heads to tighten the screws. Be careful not to tighten too much or you may risk crushing the wooden ledger board. Once secure, the frame of your structure can be attached to the ledger & should be firmly anchored to the adjoining wall. You’re then ready for the next stage of your build. At this stage, we can now begin fitting the joists. These are the long bits of pressure-treated timber which sit between (and attach to) the outer frame. They provide the main support for your deck boards. For a basic, small deck, you can probably get away with using just three joists. One placed centrally with the other two positioned at centres between the outer frame and the central joist. You should attach your joists to the outer frame using joist hangers & galvanised nails. A nail gun works incredibly well for this, though an electric drill will suffice. When fitting you should check that all of your joists & the outer frame come together at right angles. You don’t want to end up with a wonky deck! For large structures with complex joist configurations, it’s recommended that noggins are used. These are small bits of wood fitted perpendicular to adjoining joists which add rigidity to the deck frame. What if I have used beams in my frame? If you have positioned your beams along the greater length of your deck, you can position the joists along the shorter width. The latter is the most popular & preferred option, as it is much easier & results in a deck which is much more structurally sound than breaking the frame into many smaller joists. This step is only necessary if you are fitting balustrading to your deck. Otherwise you can move on to laying your decking boards. Newel posts are the spindles attached to the outer frame which your railings rest on. It is important that you fit your newel posts before laying your decking boards if you intend on fitting balustrading. To fit the newel posts you will often need a jigsaw or circular saw to cut out a chunk of the wood in the foot of the post (known as ‘rebating’ the posts). If you don’t have access to a circular saw or jigsaw you could always use a saw & chisel. This allows the newel posts to sit on the joists cleanly, while the remaining timber can be bolted to the joists – fixing the newel posts to the structure firmly. Some retailers do offer newel posts which are pre-sawn to ‘plug’ into the joists easily. If available, these can help to reduce the complexity of your build. If you are planning on fitting a pergola, you will need to fix these posts in place before moving onto fitting your deck boards. See Step 9: Adding a Pergola for more info on this. Once the load-bearing frame to your deck has been built, we can move on to laying the decking boards. Fitting will vary depending on what material you have chosen for your boards. See our guide to choosing your decking boards. Top Tip: If you have chosen wooden decking boards, you should allow them to dry out & acclimatise for around one week before fitting. Often boards will have been stored in warehouses or lumberyards where the temperature and moisture levels may have been variable. This will allow your wooden boards to reduce in moisture content & shrink down to their normal size – rather than this happening once your boards have been fitted (which can lead to big gaps between your boards). 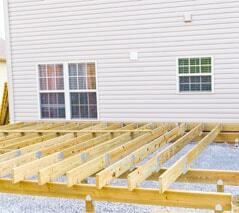 To begin laying the boards of your deck, position the first board to the edge of the frame closest to your building. When positioning your next board, you should leave a small gap for expansion during wet weather, though not so large so as to create a large gap should your boards shrink. 3-5mm is normally ample width to allow for this – roughly the width of a fixing screw. This gap should also be left between your deck boards and newel posts. Where you have had chance to dry out your boards prior to installation, you should leave between 7-10mm gap between boards. This will allow plenty of room for expansion during wetter periods. Top Tip: Cut a length of timber to your desired gap width. This can be used to place between boards during the installation & ensure consistent gapping throughout your build. It is recommended that you position all the boards of your deck on your frame before fixing anything in place. Once you’re happy that your boards are positioned beautifully & the deck frame is sufficiently covered, you can move on to fixing these in place. Each board should be fixed at all four corners. If you are installing hardwood, wood-plastic composite or PVC boards, you should pre-drill your holes – rather than hammering nails into the wood which can cause cracks or splits in the decking material. You should also fix your boards at the centre where they pass over joists or noggins. This will fix the boards in place and give the structure added durability. Continue to work through your boards. When you reach the edge of your structure, you will likely need to measure & cut your boards so they fit into the frame. Many choose to overlap the deck frame & then cut the boards to the desired length once they’ve been screwed into place. FAQ: How do I add a curve to my decking? Overlapping your decking boards is the best way to add a curved edge to your structure, as it allows you to saw & sand a curve into the surface. Your boards should sit no more than 5 inches away from a load-bearing beam or joist. Always remember to treat any sawn ends, as these will be particularly susceptible to weathering. If your deck width is wider or thinner than a multiple of your decking board width, you will either need to stagger the boards, or cut your end boards length-ways so they fit into the surface decking. Staggering the boards involves leaving a larger gap than you might normally, though this is risky as your boards may shrink and leave big gaps in the surface. The last thing you want is heels or other objects falling through your boards! We’ve compared over 20 UK retailers to find you the best price – no matter which type of deck surface you prefer! At this stage you should also fit the deck frame facing – sometimes known as ‘edging the deck’. Wherever there is an edge to the frame which is exposed & visible you should look to attach your decking boards. For the facing, you should measure the outer edge of your frame & find suitably sized boards to fit along the outside. Countersink the facing and screw to the frame, making sure that the deck facing is flush with the top face of your decking. This step is only necessary if you are fitting balustrading to your deck. Otherwise you can move on to building & attaching the steps or adding a pergola. If your deck is elevated above 300mm from the ground, you may need to fit balustrading to comply with building regulations. See our planning permissions & building regulations guide for more information on this. Start by marking the newel post with a pencil, detailing the height of the handrail. This will allow you to align the spindles with the deck frame, so they can be sawn to the correct height. Next, the handrail should be fitted to the newel posts. Pre-drill holes into the newel posts before using decking screws to attach the handrail, fixing these at an angle. Fit the handrail fully around the edge of your structure before moving onto the spindles. If you are using square spindles, these should be fitted between newel posts at a centres (spacing) of no more than 10cm. These should be fitted to both the handrail & the deck frame with ordinary galvanised decking screws. For many, this will be the end of their build. More complex builds can then move on to building steps or a pergola. Top Tip: If any of your newel posts or spindles will be hidden from plain view, sawing the top of these at an angle will allow water to run off & prevent any accumulation of water which may damage your deck in the long term. Remember to use treatment oil on any sawn edges. If your deck is elevated and there is a big drop from its surface to ground level, you will need to install steps. This is both for practicality & accessibility – as well as helping to ensure that your deck conforms to UK building regulations. The frame for the steps themselves are often referred to as a ‘stringer’. It helps to construct your steps separate to your deck & attach them afterwards. Many decking manufacturers will construct stringers, treads & risers which are pre-built to specific measurements to that they fit together easily. Generally, buying these is not a bad idea & much easier than building your own. However if you’re looking to save money it’s worth looking at building your own. We’ve detailed the steps for a full DIY build below. Measure the height of your deck frame. This will help you understand what the height of your steps will need to be. To calculate how many steps you’ll need, it’s advisable to divide the overall deck height by the average height of each step. This will also give you the height required for each riser. You should also calculate the depth of your treads. Mark on your stringer where each riser & tread will need to sit. This can be done using a ruler to mark the height of each riser from bottom to top. You will need to account for the depth of the treads and factor this into your markings. To calculate the edges of your riser, subtract the depth of your tread. These will form the lines where you need to cut your risers so they fit nicely into the stringer. At this stage you should also mark out the position of the front edge of the very first tread. To work out the edges of the tread below, subtract an overhang of the tread depth. You will not need to do this for the step which connects to the decking. At this stage you can then subtract the thickness of the risers. Draw this onto the stringer as vertical lines so you know where to cut. At this stage you should also mark out the front edges of the treads. Connect all your horizontal & vertical lines. These should form the shape of your stringer. Ensure that all your lines are at right angles, or your tread & risers might not fit flush. Once you have your outline fully drawn out, you can cut your timber with a handheld saw or (ideally) a jigsaw. For the second stringer you can simply use this as a template by drawing around it with a pencil on a new piece of timber. You will need to treat any newly sawn edges that will be exposed to the outdoor weather. First, lay paving slabs or lawn that will sit underneath the ground leading up to your deck. You can then look to fix both of your stringers to your deck frame. These should be fixed using galvanised decking nails. They can also be fixed to the ground – using an angled bracket to fix them to concrete or paving slabs. Next, fit the riser boards, again using galvanised decking screws. Finally, screw the decking treads to the stringer, using two nails at each end. Ensure the treads are firmly attached as loose treads can pose a safety risk. Sit back & admire your hard work! Like steps, a pergola can be the ideal addition to the main deck and can really compliment the aesthetics of your structure. It can be added to your deck at any time, though it will normally need thorough planning in order to fit with the other elements of your deck. Before getting started it’s important to note that because of their height, pergolas will nearly always require planning permission & will need to follow building regulations. See our guide on this for more information. If this is not a new build, you will first need to remove decking boards where your pergola posts are likely to sit. Once you’ve identified beams & joists which the pergola posts can be fixed to, bolt your support posts to the deck frame using exterior coach bolts. Your posts can also be fixed to the ground using a concrete footing, which is the more secure of the two options. Once your posts have been fixed in place, where possible you should also look to attach framing between the posts. This will help to prevent the structure from swaying as it adds to the structural integrity. This is important as pergolas can often be very top-heavy. Next, fit beams to the head of the posts – fixing one beam to every two posts. These should sit parallel to one another. Beams can then be fixed across the posts, creating a lattice framework. These should be firmly bolted in place. If desired, introduce vines between latticework and posts. This will naturally grow around the structure. Pergolas can also be attached to the wall of a house using ledger board. This can help make them extremely secure. And that’s it! How to build garden decking in 9 very simple steps. Hopefully this has given you the confidence to press ahead with your build. We’d love to hear any feedback you might have or how you’re progressing with your decking – please get in touch using our contact forms. Thanks!